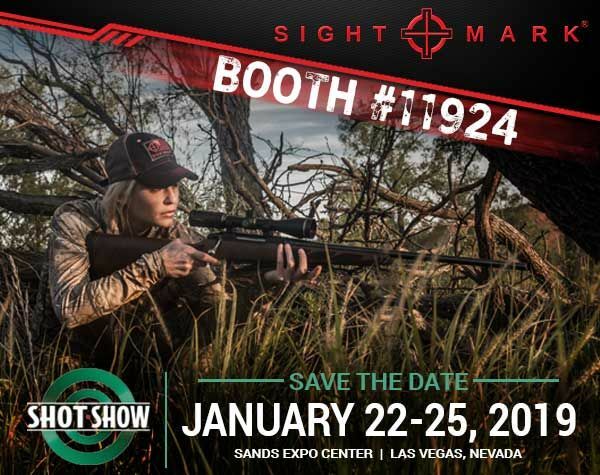 MANSFIELD, TEXAS — If you’re planning to attend SHOT Show 2019, stop by booth #11924 and visit with Sightmark! SHOT is scheduled for January 22 – 25 at the Sands Expo Center in Las Vegas, Nevada. Don’t miss out on your chance to see the superior optics Sightmark will be unveiling at this year’s show! Experience Sightmark products like the Ultra Shot RAM Series reflex sights along with the Citadel and Latitude Riflescope series. While visiting, you’ll have the opportunity to win some cool swag like can coolers, hats and pens through an air gun challenge featuring real recoil. Sightmark Ultra Shot RAM Series reflex sights feature three available models: R- (SM26031), A- (SM26032) and M-Spec (SM26034 & SM26035), creating a resilient close-range optic for target shooting, law enforcement and military. A broad lens speeds up target acquisition while maintaining a wide field of view with an advanced anti-reflective and scratch-resistant lens system. The next generation boresight is coming to a dealer near you! Sightmark Accudot Boresights are more efficient when zeroing your firearm. Simply place the boresight within the chamber for more precise sighting than your normal barrel attached boresights. Accudots are built from durable brass while featuring a calibrated diode for increased accuracy and include an internal rechargeable lithium-ion battery. Sightmark’s Latitude line includes five long-range scopes with robust 4:1 zoom ratio, fully multi-coated scratch-resistant glass, green/red illuminated reticle options, locking fast-focus eyepiece, external zero-stop ring and oversized turrets. The five models are 10-40x60 F-Class (SM13044FTR), 10-40x60 Benchrest (SM13044BR), 6.25-25x56 F-Class (SM13042FTR), 6.25-25x56 PRS (SM13042PRS) and 8-32x60 F-Class (SM13043FTR). SHOT Show is the largest trade show and exhibit for shooting sports, hunting and outdoor accessories. This is your best opportunity to explore manufacturers product lines in addition to their latest product from over 2,000 exhibitors. Talk with suppliers and customers to expand your business and knowledge to improve your sales.